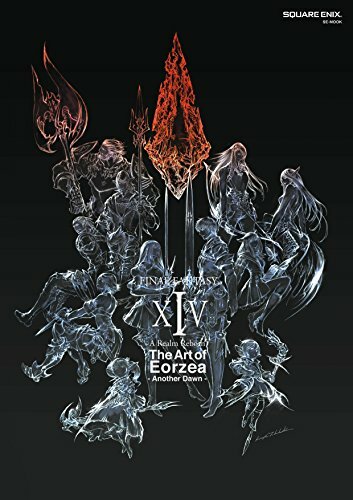 So finally, there's an official looking book for a Final Fantasy game. I've always thought it was a missed opportunity to not have any decent artbooks for the popular game series. This 304-page paperback artbook is a wonderful companion to the MMORPG Final Fantasy XIV: A Realm Reborn. The book comes with a nice sleek transparent dust jacket. Paper used is the low gloss type and print quality is fantastic as expected from Japan. Collected within are the concept art for characters, environments, weapons, creatures, enemies and props such as items, buildings and other illustrations. The book starts off with a wonderful selection of full coloured illustrations by Akihiko Yoshida, Takahashi, Nagamine, Tsukamoto, Yamate and Masao. That's followed by pages of detailed character and weapon designs with Japanese and English captions. The character and creature designs are fantastic. I've always enjoyed looking at Final Fantasy character and creature art. With each version of the game, there will be a new take on the characters and creatures, especially those that have appeared throughout the series. As for the environment art, there are overview drawings of towns, cities as well as interiors. There's a nice mixture of coloured illustrations and sketches. They are all detailed and look great. This book definitely is worth the money.